Western blot analysis of extracts from HT55, SW1463, and HCC827 cells, untreated (-) or treated with PNGase F (+), using CEACAM8 (D2F5U) Rabbit mAb (upper), or β-Actin (D6A8) Rabbit mAb #8457 (lower). Western blot analysis of extracts from 293T cells, mock-transfected (lane 1) or transfected with CEACAM8-mycDDK (lane 2), CEACAM6-mycDDK (lane 3) or CEACAM1-mycDDK (lane 4), using CEACAM8 (D2F5U) Rabbit mAb (upper), Myc-tag (71D10) Rabbit mAb #2278 (middle), and β-Actin (D6A8) Rabbit mAb #8457 (lower). CEACAM8 (D2F5U) Rabbit mAb recognizes endogenous levels of total CEACAM8 protein. 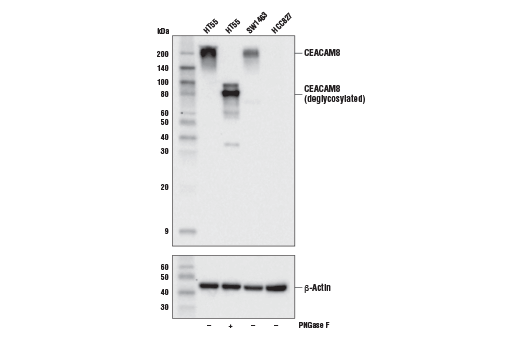 This antibody does not cross-react with CEACAM1 or CEACAM6 proteins. Monoclonal antibody is produced by immunizing animals with recombinant protein specific to the carboxy terminus of human CEACAM8 protein. Carcinoembryonic antigen-related cell adhesion molecule 8 (CEACAM8), also known as CD66b, is a member of the CEA-related cell-adhesion molecule (CEACAM) family (1). CEACAMs bind to themselves and other family members to carry out numerous cellular functions, including proliferation, signaling, differentiation, tumor suppression, and survival (2). CEACAM8 is a single-chain, glycosylphosphatidylinositol (GPI)-anchored, highly glycosylated protein that under normal conditions is expressed almost exclusively on granulocytes (3). Heterophilic interactions of CEACAM8 with other surface molecules, such as CEACAM6, have been shown to be involved in regulating cell adhesion in a calcium-independent manner (4). As such, CEACAM8 has demonstrated utility as a marker of neutrophil and eosinophil activation (5,6) and in pathological conditions is shown to be highly expressed in primary myelofibrosis and acute lymphoblastic leukemias (7,8). Assessment of CEACAM8 positive tumor-infiltrating neutrophils has demonstrated value as a prognostic factor in multiple cancer types (9,10). Kuespert, K. et al. (2006) Curr Opin Cell Biol 18, 565-71. Bonsor, D.A. et al. (2015) Proc Natl Acad Sci U S A 112, 13561-6. Zhao, L. et al. (2004) J Immunol Methods 293, 207-14. Kuroki, M. et al. (2001) J Leukoc Biol 70, 543-50. Yamanaka, T. et al. (1996) Protein Expr Purif 7, 438-46. Yoon, J. et al. (2007) J Immunol 179, 8454-62. Hasselbalch, H.C. et al. (2011) Leuk Res 35, 1330-4. Lasa, A. et al. (2008) Ann Hematol 87, 205-11. Waldmann, T.A. (1987) Adv Exp Med Biol 213, 129-37. Zhang, H. et al. (2018) Ann Surg 267, 311-8.